Philadelphia Vireo is a small bird with a grey crown. It has greenish upperparts, yellow-washed undertail coverts, very faint greyish olive wing bar, blue-grey legs and feet. Philadelphia Vireo has a dark eye line extending through lores, and often shows a diffuse whitish crescent below eye. It has various shades of yellow on underparts, with brightest colour on breast and throat. It has a short, thick, slightly hooked black bill. Both sexes are similar. Immature is similar to adults. Philadelphia Vireo was the first observed near Philadelphia en September 1842, by John Cassin. Philadelphia Vireo nests in the woodlands of Canada and the extreme northern USA. Nest is a cup made with twigs, fibres, spider webs and grasses. It is located in scrub of secondary growth area, near water, at about 10 to 40 feet high. Female lays 3 to 5 spotted white eggs. Incubation lasts about 2 weeks, by both sexes. They tend the young, who leave the nest in about 15 days. Young birds usually stay with parents for e few weeks, before moving southwards, to their wintering grounds. Philadelphia Vireo primarily feeds on insects, especially caterpillars, in all seasons. It also eats spiders, snails, fruits and berries. Monitoring data shows that populations of Philadelphia Vireo are holding steady, due probably at the good health of their woodland breeding habitats across Canada and extreme NE USA. Migrants are generally silent. Song is a broken series of slurred notes. Each phrase usually ends in either falling tone or raising tone. It may repeat the same phrase twice or more in a row. Philadelphia Vireo can be found in summer in a variety of wooded habitats. They favour open woodlands, streamside willows and alders, and areas regenerating after fires. It breeds in broadleaf forest, thickets and parklands. Philadelphia Vireo breeds across much of Southern Canada, except British Columbia and along the US border from Minnesota to Maine. It winters in Central America. 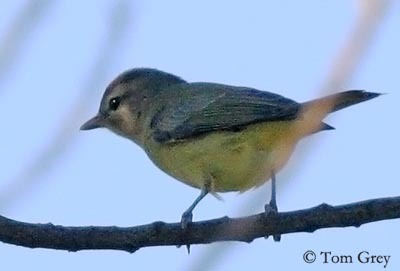 Philadelphia Vireo gleans preys from foliage, from perch or in flight. 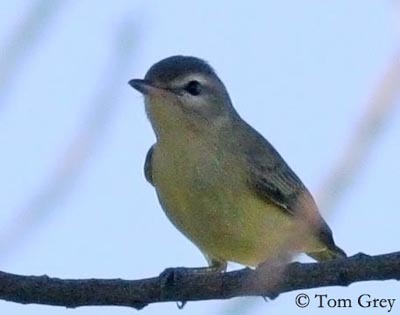 Philadelphia Vireo and Red-eyed Vireo can coexist in the same places because the first modifies its behaviour either to exclude the other from its territory, or to avoid it by foraging in areas seldom used by that species. Philadelphia Vireo and Red-eyes Vireo exclude each other from their territories. Philadelphia vireo has an agile flight.